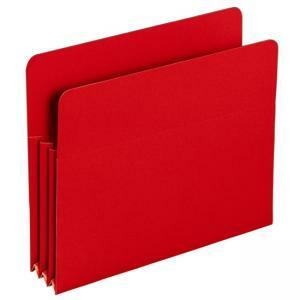 Poly File Pockets offer strong, heavyweight polypropylene construction and a 3-1/2" expansion to hold lots of paperwork. Use bright hues for color-coding. Drop front panels provide easy access to contents. Design also features 6" high, matching color gussets and top corners that are rounded, front and back. Acid-free, archival-quality poly material is waterproof and tear-resistant to protect contents.